we might as well get used to them  they're here to stay. Hating wolves is not my custom. In fact, I kind of like having them around. Sure, they're hard on our far north fawns, eating three out of four of them by November 1st each year, keeping our deer numbers down and making our surviving deer unusually difficult to hunt. However, they do provide some benefits. For one, whenever some stranger with no knowledge of field etiquette or sportsmanship decides to park his vehicle at our camp and wander about our hunting area  invariably ruining the hunting for one or more of our hunters for one or more days  he never comes back, heading away convinced wolves have eaten all the deer. Another benefit is, because wolves hunt our deer year around and make them much more elusive than whitetails elsewhere, more of our bucks survive enough hunting seasons to become fully mature. We therefore always seem to have mature bucks to hunt, making our hunting much more exciting. Of course, it takes extra effort and skill just to see such bucks but we see enough of them to find it difficult to understand why hunters in adjacent areas so frequently complain the so-called buck-to-doe ration is all out of whack. By now, many of those who hunt whitetails in wolf country (including more than half of Minnesota hunters) are beginning to realize hunting methods or tactics that provided agreeable deer hunting success when wolves were not as numerous and widespread as they are today, are no longer as productive as they once were. Whereas many believe it's therefore time for some biologically sound wolf management, I don't believe reducing wolf numbers is ever going to make the old hunting methods as productive again. Wolves are going to go away and whitetails that live among them are not going to become less elusive. Though not simple, the answer seems simple: learn to hunt whitetails made more elusive by wolves. To do this, the hunter must first understand relationships between our wolves and deer. From May until early November virtually all wolf droppings found in the four-square-mile area where I hunt and study whitetails contain deer hair, fawn teeth (unworn) and fawn-sized hooves and dewclaws. Following mild to moderate winters, most of our does that are two years of age or older bear twin fawns in May (some born in June and a few in July). After November 1st, we rarely see more than one fawn per two adult does. 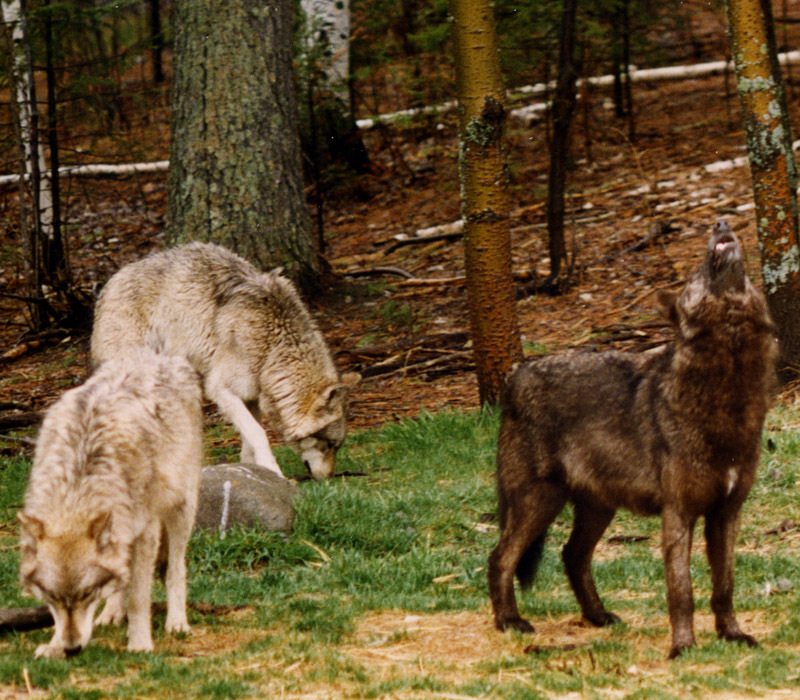 Throughout the warmer months, single adult wolves  male or female  kill fawns providing food for themselves and pups. Fawns that survive until November learn early the value of remaining frozen in dense cover, such as deep grasses, when wolves are near. They never forget this lesson. It becomes a wolf country whitetail's number one means of avoiding threats human hunters. Fawns that survive to become yearlings are raised by experienced adult does that are skilled at hiding their young; by does that bed well away from wolf cruise routes, trails used by wolves when searching for vulnerable prey, or by does that bed in less-traveled areas between wolf ranges. Occasionally forced by marauding wolves to temporarily abandon their home ranges, young whitetails soon become acquainted with areas as large as 36 square-miles where they find refuge in difficult to travel areas such as wooded bogs and swamps. Aggressive human hunters, still-hunters and those who make drives, have a similar affect on whitetails. Except in deep snow, by November 1st most fawns are large and fleet enough to outrun wolves and from this time until snow-melt in spring, wolves must hunt in packs and use cooperative hunting methods to obtain venison. I have often been privileged to observe these methods. On several occasions I have found myself close to a number of wolves (six or more) waiting for a single wolf to drive a single deer toward them. I have watched a wolf sneak closer and closer to a feeding deer and then spring toward the suddenly terrified prey and drive it hell-bent downwind toward the rest of the pack waiting in ambush. I have watched downwind wolves fan out in cover and close in on a hapless victim that was driven in their midst. I have watched deer driven by lone wolves veer left or right upon gaining a comfortable lead and then swing into the wind, thence able to smell whatever is ahead and thus avoid ambush. When pursued, experience adult deer expect an ambush ahead. Even when driven by a line of human hunters, experience adult deer will hide in cover or swing into the wind as quickly as possible to avoid the expected downwind ambush. I have watched entire packs of wolves pursue a deer, likely after their chosen prey managed to avoid their ambush, and then soon give up the chase, likely preferring to conserve their energy and begin anew their search for a more vulnerable deer. Those who have long studied wolves say wolves fail to kill a deer in at least five of six attempts. Fortunately for the packs, they only need to feed on one deer per week in winter. Whitetails that have survived repeated encounters with wolves soon learn to recognize whether they are actually in danger or not. I have watched standing or bedded adult deer remain frozen in cover as a string of wolves (pack) passed downwind, acting as if unaware of the near presence of the deer. I don't know if those deer felt it was unnecessary to flee because they had often proved they could out-run and out-maneuver those wolves or they felt safe because it seemed obvious the wolves were uninterested in them (had not selected them as a prey). Steadily moving humans are generally treated the same way, whitetails standing or lying frozen in cover, watching them pass and then resuming whatever they were doing when the hunter is a safe distance away. Wolves that seem uninterested in a nearby deer may realize they can't catch that particular deer but they may only be acting. Twice I have watched packs stream past feeding deer and then halt over the next rise, out of sight of the deer, downwind or crosswind, and then silently split up, all but one beginning a wide circling movement toward the downwind side of the chosen prey and the remaining wolf beginning a cautious stalk back toward the feeding deer. Another form of acting is used by single wolves for taking fawns: the wolf wagging its tail, sniffing the ground and moving about, never appearing threatening, never looking toward the bedded fawn or moving directly toward it. The soon mesmerized fawn simply watches as the wolf gradually works nearer; finally close enough for an easy pounce on its unsuspecting prey. Acting as if not hunting  moving non-stop at a moderate pace, head pointed straight ahead  is an effective way for a human hunter to avoid alarming wolf country deer and keep them from abandoning the area while hiking to or from a stand site. Wolf country fawns that survive to adulthood are exceptionally alert, wary and skilled at using the terrain and cover of their ranges to avoid dangerous encounters with wolves. They know how to use difficult footing such as wooded swamps and bogs and obstacles (jumping over things wolves cannot jump over) to discourage pursuit. When it is too windy (too noisy) to hear wolves moving about safe distances away, while precipitation is moderate-to-heavy or while trees are popping in early winter, experienced adult whitetails bed in dense cover with view of their back trail and there they remain until it is quiet enough to hear wolves safe distances away again. In wolf country, older, more experienced whitetails feed more at night and less by day  some older bucks becoming almost completely nocturnal. Some older wolf country bucks and does head to their bedding areas at sunrise and do not stir again until sunset. To more regularly succeed at hunting experienced adult deer in wolf country, forget drives and still-hunting. Yes, you can take wolf country deer using these methods, but most will be inexperienced fawns and yearlings. Instead, become a stand hunter, not necessarily a tree stand hunter. Whether sitting on a backpacked stool at ground level (like me) or on a seat up in a tree, always pick a spot where you have motion-hiding cover in front of your body and a solid, natural background behind your body. Always sit and always wear a camo headnet (cap on top). While hunting in this manner at such a stand site, even the most cunning of bucks in your hunting area cannot see or hear you, making it impossible for them to routinely avoid you (at least for a while). Scout two to three weeks before the opener, selecting approach trails and stand sites with three or more good reasons for hunting there. Always hunt within easy shooting range of fresh tracks and/or droppings made by the kind of deer you'd like to take. Don't waste time elsewhere. Use one to two different stand sites daily unless you have a very good reason for hunting at one site longer but never hunt at one site more than two days. Experienced wolf country whitetails are very adept at finding and avoiding stand sites used by humans. After one-half to two days at one site, you're probably wasting valuable hunting time. Never cross large openings to get to a stand site. Always approach a stand site from downwind or crosswind and always sit downwind or crosswind of where you expect to see a deer. Be at your stand site at first light in the morning. Hunt any time you want after that. Sometimes later hours are productive, but by far the best hours for hunting in wolf country are the first two legal shooting hours of the day. All of the above advice works. It's worked for my hunting partners and me many, many times during our past 21 years [since 1990] of hunting bucks among great numbers of wolves. See the wolf country buck it enabled me to take last November . 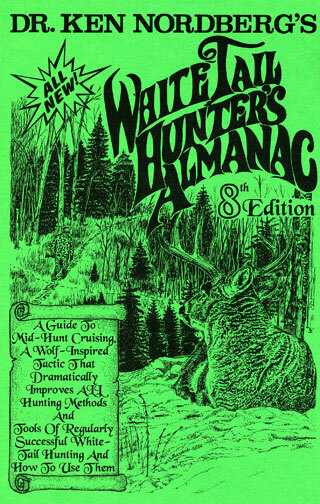 Everything you need to know to become a regularly successful whitetail hunter (a regularly successful trophy-class buck hunter if you prefer) is found in Dr. Ken Nordberg's books, "Whitetail Hunter's Almanac, 1st through 9th Edition," and/or his 18-hour series of buck hunting school DVDs. 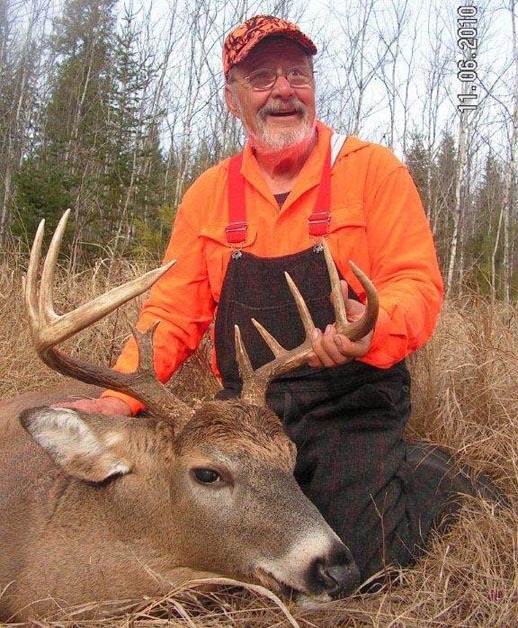 Dr. Nordberg has written nine, long popular whitetail hunting instruction books based on more than three decades of scientific, hunting-related studies of wild deer over much of North America. 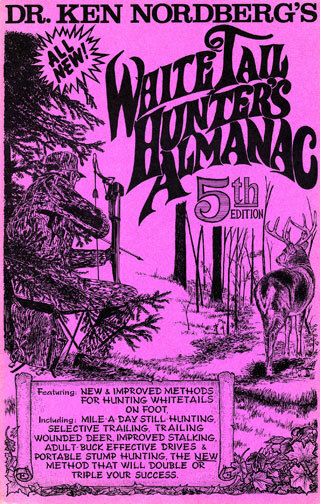 Each covering different subjects, his books introduce several new and much improved hunting tactics, one wolf inspired, developed to make you regularly successful at hunting mature bucks (and other deer) with gun or bow. 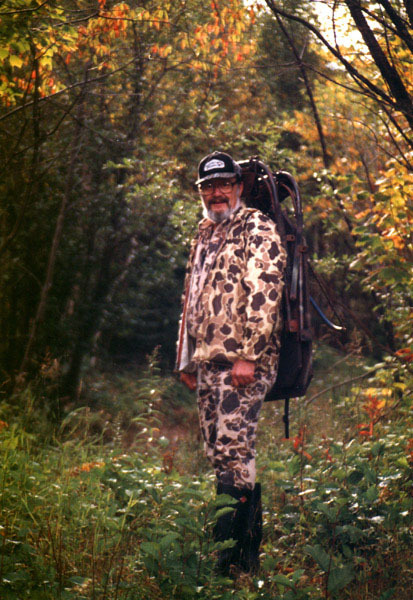 For order forms and more information about his books, sign guides and newly released DVDs from his famous buck and bear hunting schools go to www.drnordbergondeerhunting.com.